Network equipment has still been at an all-time high performance technology. The past year in network equipment has leapt huge hurdles but, I’d guess it might level off soon, at least before the next reign of technology rolls through, which could be any-day. Surveillance installs have also been keeping steady as more affordable and high-performance machines are now at hand. 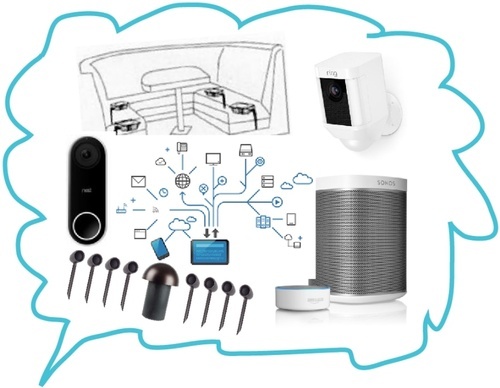 Lots of systems without wiring lean towards the likes of Ring products (or similar) with simple-battery-powered installs (also dependent on good WiFi) and video intercom bells and whistles. Pretty cool and functional stuff there. Yeah 4k TVs with HDR, Atmos/DTS and other surround fields are still impressing but, now becoming standard. I keep finding myself missing some seat shakers (transducers attach to your couch to shake you into feeling the bass that’s too low a frequency for you to even hear) and finding the best way to hide a TV/screen in the room that’s not really a theater, Samsung’s FrameTV, pop-up/down solutions I’d think would be evolving given the real estate of the now 65” “standard” TV size, eating up your living walls. Anyone need some better sound in their yard for this coming summer? I might suggest checking the Sonance Sonarray system. Sourced with some Sonos and voice-controlled “Alexa”. We’ll be here to help whatever the solution may be..